Updating your home with natural stone kitchen countertops is an exciting home renovation project, and choosing the perfect material for your lifestyle and décor is just the first step. The next phase is installation, and if you’ve never gone through the process you might not know what to expect. 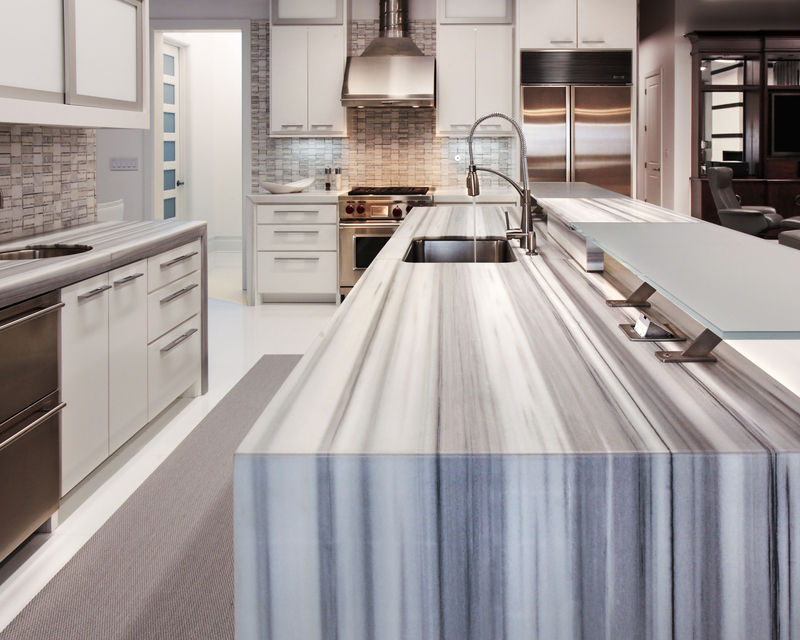 Choosing natural stone is only the first step in your countertop installation process. Photo courtesy of Natural Stone Designs. 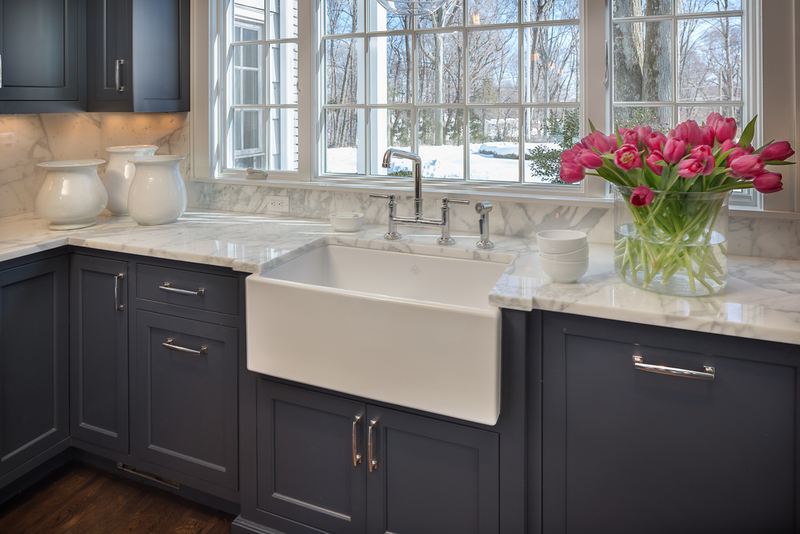 Fabricators must know the make and model of sinks, faucets, and appliances going in or against countertops. Photo courtesy of Ontra Stone Concepts. 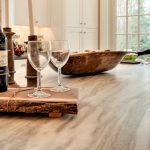 Installation of natural stone countertops can take two to three weeks, and the first step is having a measurer come to your home, says Sanders. 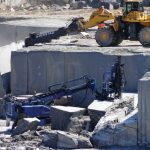 “They will take measurements of your entire room so the fabricator can fit the stone to your unique space and appliances,” she says. “We use digital measuring tools that get recorded in our system, and it takes about an hour. 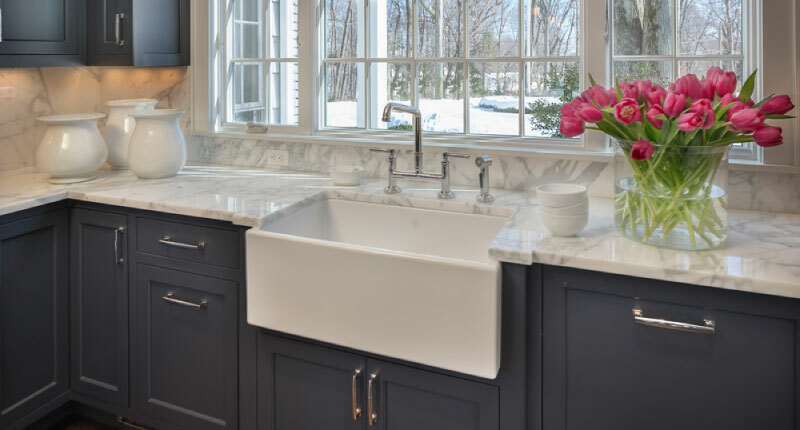 It’s typically the first time we’re in the customer’s home.” Prior to templating, your fabricator will also need to know the exact make and model of sinks, faucets, and appliances going in or against the countertops. 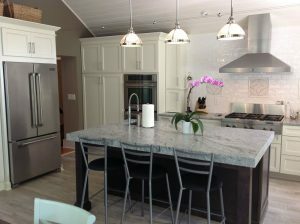 They should also be made aware of other design details, including edge details, backsplashes, and rear wall treatments. While many installers utilize the latest digital measuring technology, Buddy Ontra, owner of Ontra Stone Concepts, a stone fabrication expert located in Bridgeport, Connecticut, sticks with the “old school” method of making physical templates using luan wood strips. 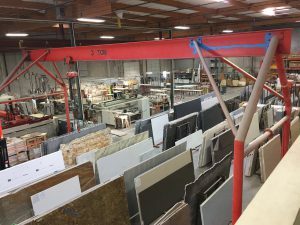 This process offers customers a preview of what their countertop will look like by creating a skeleton frame that is placed over the stone. After the template is finished and approved, the stone is cut and fabricated into the countertop at the installer’s workshop, and an installation date is scheduled. 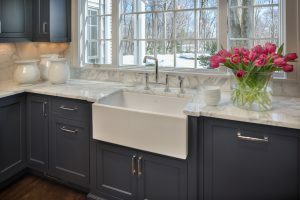 If old countertops are in place, they will need to be removed prior to installation to provide enough time to make repairs if cabinets become damaged in the process. In addition, the existing sink and cooktop will need to be removed, with water, gas and electricity shut off prior. Homeowners can expect to welcome multiple installers into their homes for large installation projects. Photo courtesy of Ontra Stone Concepts. 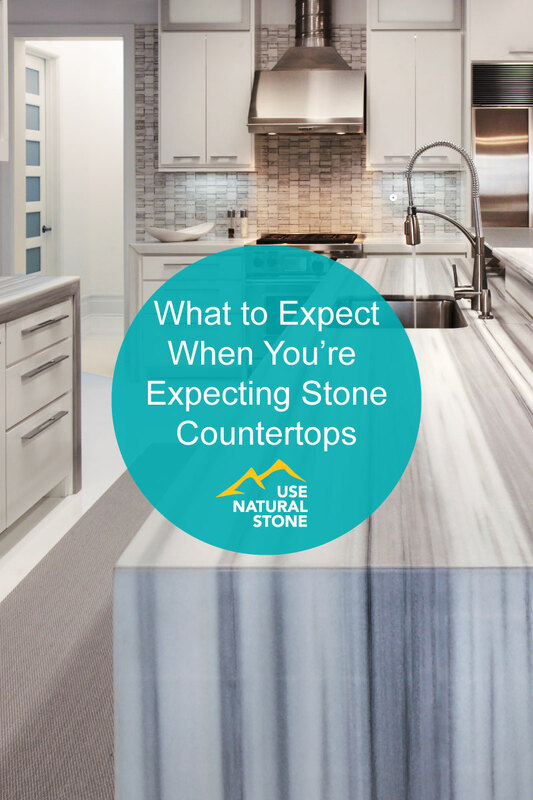 When the big day arrives, homeowners can expect to welcome at least two installers who will deliver the prepared countertop and put it in place. Large jobs may require as many as four people. Homeowners must be home during installation. Before the team arrives, you will be asked to clear the pathway for the installers to enter the home. It’s a good idea to take extra measures to protect valuables or breakables. Most installations take four to eight hours. Large areas can sometimes take more than a day, adds Sanders. If the countertop has seams, a strong chemical adhesive is used to cement the pieces together. Then the countertops are adhered to the cabinets with silicone or paintable caulk. 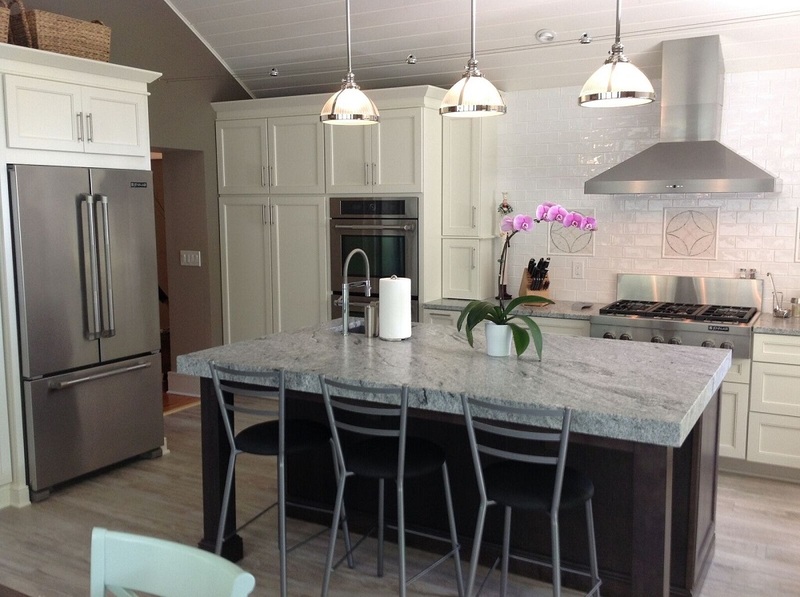 If your kitchen includes a cooktop instead of a slide-in range, the installers may cut the hole onsite. 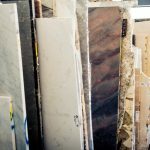 Though countertop installations require a bit of preparation, choosing natural stone is worth it. Photo courtesy of Stone Interiors. Once installation is complete, the homeowner will be responsible for scheduling a plumber to come and reconnect the water source, and an electrician to reconnect drains, water, gas, and electrical hookups. This generally happens the day after the countertops are installed to give them time to set. If you are having a backsplash installed, that should also be scheduled after the countertops are installed. Then your kitchen is ready to go. While the process requires a certain amount of prep work, it’s well worth it. “You’re investing in a piece that will last for years to come, contributing to value of your home and providing a piece that can be enjoyed possibly for generations,” says Sanders.